Come into the Benton County Clerk’s Office to show your proof of identity and pay for the license. After the marriage ceremony has been performed, return the license to our office so it can be recorded. $52.00 license fee is non-refundable. Licenses may be obtained in any county in Oregon, and can only be used in the State of Oregon. No extensions of time or refunds of money are made once the license is issued. If an issued license is lost or destroyed, it can be replaced at the County Clerk’s office. 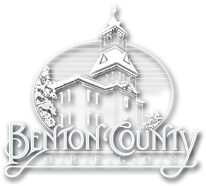 If you wish to use the marriage license immediately, waiver request forms are available in the Benton County Clerk's office. A fee of $25.00 will apply. Once the license is effective, it is valid for a 60-day period. The marriage ceremony must take place within that 60 day period, or a new license must be obtained. Once the marriage has taken place, and the completed marriage license is returned to the County Clerk, an official certified copy of the license can be obtained from the County Clerk for $7.75. Certified copies can be pre-purchased at the time of application at a reduced fee of $4.00 per certified copy. A decorative marriage certificate will be provided. This is not a legal document and may not be used as proof of marriage. If more certified copies are required, they can be purchased at the County Clerk's office.